Leading up to the Halloween season, Universal Orlando is once again surveying theme park fans online to determine the level of interest in including a variety of film properties and celebrities for the popular annual event. Survey details combined with a few recent celebrity tweets have signs pointing to magicians Penn and Teller being a potential new act to join Halloween Horror Nights 2012. In a new survey, Universal Orlando presents respondents with a list of movie and TV franchises as well as celebrities, asking if any of them would be desirable to be seen in future Halloween Horror Nights, either in development of haunted houses or as part of live performances. The list of 13 (naturally) celebrities includes familiar horror movie directors (Eli Roth, John Carpenter, Clive Barker, Guillermo del Toro, John Landis, Wes Craven), musical artists (AC/DC, Black Sabbath/Ozzy Osbourne, Rob Zombie, Marilyn Manson, Alice Cooper), and two magic acts: Chriss Angel and Penn & Teller. The list is similar to an annual survey Universal Studios Hollywood sends out shortly after the conclusion of each year’s event to get ideas for the following year. But amidst the usual array of horror and shock rock icons are Penn and Teller, who have had experience with Horror Nights in the past. The first Halloween Horror Nights at Universal Studios Hollywood in 1992 featured many live acts, including Penn and Teller. Their show was appropriately filled with plenty of blood and gore. Could they now be returning to the Halloween event 20 years later, perhaps in Orlando this time? @pennjillette: So excited about possibly doing this new thang with Universal.But, I guess I’ll go out to supper with friends. \Good house steak in Orlando? 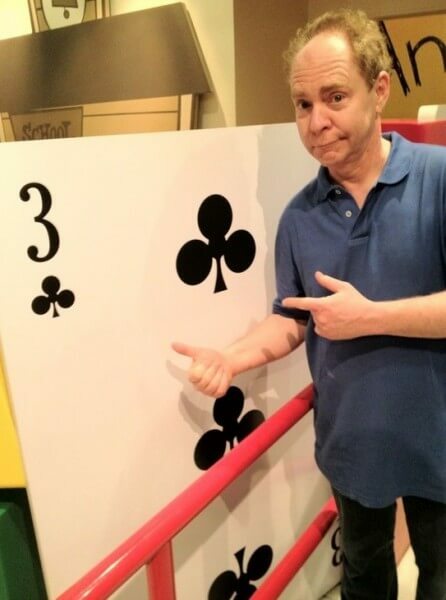 @MrTeller: Is THIS your card? I’m at Toy Story at Walt Disney World. The pair has been in Orlando for a few days, having recently performed on Feb. 3, 2012 at Universal Orlando CityWalk’s Hard Rock Live. They have another Central Florida show coming up on Friday in St. Petersburg, near Tampa. But it seems that aside from having fun in the parks and enjoying a good steak (Penn ended up dining at International Drive’s Texas de Brazil restaurant), they’re also discussing either performing at Universal Orlando, developing a new show, or possibly even joining in the design of a haunted house, much like Alice Cooper did at Universal Studios Hollywood in 2011, Rob Zombie before that. Celebrities aside, 13 movie and TV horror properties were also included in the survey: Exorcist, True Blood, Hellraiser, An American Werewolf in London, Texas Chainsaw Massacre, Paranormal Activity, Trick ‘r Treat, A Nightmare on Elm Street, La Llorona, Halloween, Walking Dead, Universal Classic Monsters (i.e. Dracula, Frankenstein), and The Devil Inside. The survey goes on from there to spotlight a few select celebrities and properties, asking survey takers to individually rate each one. Those highlighted are Wes Craven, Eli Roth, Clive Barker, “Halloween,” and “A Nightmare on Elm Street.” Each of these have been featured in a Halloween Horror Nights event at one time or another, so it’s interesting that they are once again asked about in this new survey. Comparing the Orlando and Hollywood versions of Halloween Horror Nights, the survey concludes by including two TV commercials from 2011’s events and asking for thoughts on which was better, which was scarier, which had a better story, and which had more memorable characters. Here Universal is essentially comparing Lady Luck from Orlando’s Halloween Horror Nights 21 to the vague notion of terror portrayed in Hollywood’s 2011 ad. Both ads are included below. With this new survey, Universal Orlando has now made it a trend to survey its fans in February to help decide the direction of their popular annual Halloween event. In a survey last year, Universal Orlando asked about adding a new ticket option, which ultimately came true. But that doesn’t necessarily mean that Penn & Teller, or any other person or property mentioned above, will find their way into the event. Nothing can be firmly concluded from the survey with regards to what themes, characters, franchises, or celebrities will appear in either coast’s version of Halloween Horror Nights 2012, but it does offer a bit of interesting insight into the development of the event, which began the moment 2011’s version ended. Though the creative forces behind the event want to use the best ideas possible for their haunted experiences, from a marketing standpoint, Universal simply wants to decide which properties and personas will sell the most tickets and generate the most buzz. Would a a show developed by magician duo Penn & Teller be more enticing to potential visitors than a haunted house featuring Bill and Sookie from True Blood? Would Universal’s classic monsters draw more horror fans than a haunted house inspired by Guillermo del Toro’s recent works in the genre? And does featuring an “icon” like Lady Luck help inspire more interest in the event than showing a more abstract representation of fear in a TV commercial? These are the questions Universal asks in deciding exactly what Halloween Horror Nights 2012 will be. But it’s not likely we’ll know those answers until the annual teasing and eventual reveal over the summer. Until then, fans can once again this year speculate about Halloween Horror Nights a few months early. And, based on the recent celebrity tweets, we can be sure that Penn and Teller are at least in talks to work on something for Universal Orlando Resort. Would be a fantastic addition to an already fantastic event. Please let it be true! HHN is so popular, do they need celebs to attract more people? Don´t get me wron, it would be awesome to see P&T but I would pay a ticket to see them perform in the Blue Men venue. It may not be them performing in person. They could be developing a show for the event or perhaps a haunted house. Universal does feature some sort of live performance at HHN each year and a new show could replace last year’s Death Drums. Awesome write-up Ricky! Though your probably right, seeing a live PT show included with admission would be awesome. could the penn and teller dou also be halloween horror nights media icons while the real icon is waiting in the shadows. the theme for 2012 could be a based on the end of the world and other disasters, disease, death, faimine, war, and maybe a figure representing demons, zombies, mutants, and people who believe these supersitions are coming to pass. the opening video or show could be a preacher warning the end or some kind of demonic force. it could be based on movies, television series, and other media things represent a possible disaster scenerio. we could see a more ancient evil more scary than all the past icons he or she or maybe even some kind of group of twins like angels denoms god satan jesus christ antichrist. think about the most recurrent theme is fear and some form of death so a grim reaper or ancient demonic force would arise. fear could be the one who bring chaos, death, and other evils. maybe fear will kill off the previous icons to make him into his more sinsiter form. ghostface could be a new servant of fear together with icons from horror movies and television shows or a celebrity associated with the horror genre beomes the main icon. alice cooper, eli roth, freedy, jason, jigsaw, chucky, and others are unleashed but now they will all be killed or gave up their own evil essence to fear. I think they should do a VS. a godess of complete hatred and distruction, and a godess of lust and and sweetness, but with a painfully evil side. each godess should take over a park ( One at IOA, One in universal). People can go through the houses on each godess’s side and as you leave the park, vote on which godess’s scare is more powerfull. I dont believe they should use celebs, or even movies as there icons. I think what they think up in the imaginations that can be brought to life is much scarier than what was already on screen. I mean, Look at Jack the Clown, The caretaker, even the storyteller. Pure horror. I unfortunately did not take screen captures of the survey. I should have. But I wouldn’t be writing about it if it weren’t true. I made the photo collage above using images from the survey. And note that the two commercials above are unlisted on YouTube, uploaded specifically for the survey. a new more evil icon shall arise he or she is a servant of fear. this year at 22 we shall all see our end as new horrors awat. a new icon is something based on death and or some other type of evil. penn and teller will we fear’s newest servants but they will be more denomic than they appear. so each of them would bring a new era of darkness. i am fear you shall face me you shall bear my mark. i demand more. this is the start of the new era of darkness. my new representatives will make you scream i will have more new horrors and fears to showcase this year. eli roth, clive barker, halloween starring micheal myers, nightmare on elm street starring freedy, john carpenter, guillermer del moro, john landis, wes craven, acdc, black sabbath, rob zombie, marulin mason, alice cooper, penn and teller, chris angel, exorcist, true blood, hellraiser, american werewolf in london, texas chainsaw starring leatherface, paranormal activity, trick r treat, la llorona, walking dead, devil inside, dracula, frankenstein, and more will come soon including bill and ted show of course. fear will choose which one become the icon of the event. but we could have a more twisted figure come soon and kill us. this year is 2012 so maybe end of the world type stuff be used in the event this year. they could have the preacher from welcome to hell scarezone as the icon or maybe the grim reaper. something representing death or fear. another is the ringmaster jack like in past years or some kind of two icons like twins or polar opposites like god or devil jesus antichrist. well we could be introduced to a son or daughter of a previous icon with mother father son daughter type icons. yeah caretaker and cindy jack and the clown girl. fear could be two heads or past present future type icon. here is a clue darkness could that be the new icon for this year. see fear has a male child or son since i seen darkness in the arrival show in 2006 introducing other icons. another thing is could this year be the year without an icon like in the past but penn and teller may appear in commericals, the enterance gate video, and merchanside like dr jimmy said. this year we might have a 100 years of horror type event bring back all the old icons and other symbols of halloween introduce new icons or more recent icons as well. penn and teller may also be killed off with other celebrities and important figures to the horror genre and other things related to horror. if an apocalyspe theme is possible than how about a preacher screaming the end is near or demons or supernatrual or natrual disasters and other weird things happen like plagues, wars, faimines, earthquakes, floods, volcanos, hurricanes, tornadeoes, and diseases that lead toward the end of our world . maybe have zombies or toxic chemicals raditation nuclear testing faclities . i am fear soon you will all perish you will bear my mark xxii. i will kill all of you it time to die. no more happy endings. are you in red you win black you lose. welcome back to the palace theater. tickets please. action . film is only a dream fear is forever. when you walk beyond the mirror. chant his name. no more clowning around. you do not know true fear. he will get a grin again. why so afraid what your favorite scary movie. 1 2 3 4 5 6 7 8 9 never sleep again. game over. let the games begin. you and fear will be night friends forever.